I have mixed feelings with the way the Philippines has been covered by international media in the past few months. On one hand, I have seen really good journalism. Many well-written and balanced articles have successfully conveyed what is going on in the country, in some ways more in-depth than our local newspapers have covered. Because they are writing for a foreign audience, these articles often offer political and cultural contexts that many local writers take for granted. On the other hand, I have seen the tendency to go for the dramatic override journalistic principles of fairness, and even a basic sense of humanity. Just look at the coverage of the Supertyphoon Meranti (Local name: Ferdie) - and the headlines about it. When a satelite photo of Itbayat Island being right at the eye of the world’s fiercest storm was released, it caught international attention, not out of concern for the people, but out of fascination over the amazing image. “Crazy satellite images show Super Typhoon Meranti swallowing tiny island” Mashable goes, inviting its readers to marvel at the “craziness” of the image and of a supertyphoon swallowing a "tiny island”. “See Pics! NASA satellite captures the fierce might of super typhoon Meranti” ran an India TV headline. Surely, if a cyclone hit Kolkata with the same "fierce might", they would never imagine the exclamatory "pictures" as more interesting than the "people" who are suffering the fate. “Watch: Super Typhoon Meranti Topples Shipping Containers Like a House of Cards” goes another news story as if they had stumbled upon a deleted scene of a Spider-man movie. Juxtaposed with the Ivatan’s lament that they are being ignored amid this calamity, I cannot help but be indignant at the inhumanity of the news coverage. 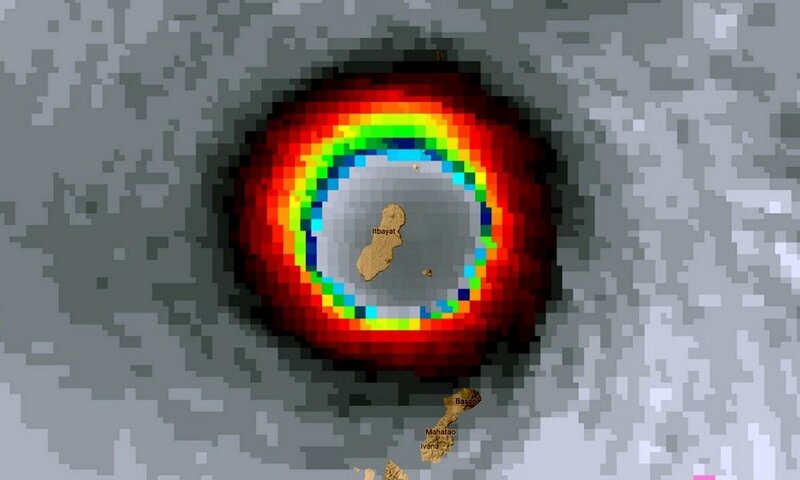 It’s as if the supertyphoon were a mere spectacle; one big show. But in a way, we shouldn't be surprised. They are after all, writing for their readers, who would be more fascinated by a dramatic satelite image than the (rather boring) bit about people in a faraway island being hit by a typhoon. Of course, for Americans, it would be an entirely different story if the "tiny island" in question - even smaller than Itbayat - were Manhattan. And of course, if many people died, that too, would merit their attention. Alas, with so many tragedies and calamities happening everyday, a disaster would have to be quantitatively more significant for it to get coverage - and this is no exact mathematics: 10 deaths in London would surely merit more attention than a hundred in Liberia. Can we blame English newspapers for being more concerned about the Londoners? How then should we respond to this "blind eye of international media"? First, we need to realize that we (and by "we" I mean the Filipino people) are not their primary audience, and even when they adhere to journalistic ethics, the issues that they would highlight are the ones that resonate with their audiences more. When Rodrigo Duterte made a speech about an independent foreign policy, it was the perceived slight to Barack Obama that caught the West's attention - not Duterte's assertion of an independent foreign policy (which is probably more significant in geopolitical terms). Duterte's invectives had particular currency in America because they reminded them of Donald Trump. And in their worldview of the Americans (and West) being the protagonist, they are always on the lookout for people who can be cast as colorful enemies -as in any James Bond or superhero movie. Duterte, like Putin and Kim Jong-Un, happened to fit the bill. And so I think we should have a healthy dose of skepticism over how the Philippines is being portrayed by foreign media. Not because they are politically motivated in a local sense (I do not buy for a second those conspiracy theories that foreign media have been blinded or bought by the Liberal Party - these journalists are no fools - even though they may have their own political leanings back at their home countries) - but because there is already an inherent bias among them by virtue of their positionality, their upbringing, their audiences, their values. News itself is geared towards the dramatic, as our high school journalism teacher once taught us: "When a dog bites a man, that's not news. When a man bites a dog, that's news." Thus we shouldn't complain that a plane crash gets reported while the millions of flights that go smoothy don't. Second, we should appreciate and support our local journalists, because they are more invested about our country than foreign correspondents are. Sure, they are more prone to bias in terms of local politics, but they are also more prone to care about what's happening, and share our concerns. While international media marveled at the satelite images, local media like Rappler shared details of relief operations and how you can help - even airing the lack of media attention to the calamity. Sure, there are some bad eggs (there's a radio reporter in Palawan who sings praises of coal plants), but vilifying all of local journalism as "bayaran" (paid) and "biased" does not do justice to people who put their name on what they say and risk their lives in doing so (a BBC reporter does not have to worry about consequences of his article about the Philippines; Filipino journalists risk their lives each day as the Maguindanao massacre made stark). Of course, local journalists too are prone to sensationalism, partly because Filipino audiences, too, are more receptive to the dramatic, the unusual, the scandalous. We too, have been desensitized to all forms of spectacle, and must be presented with "crazy" images, dramatic stories, "insane" personalities" for our attention to be piqued. Thus the stuff of entertainment becomes the stuff of news. Third, this knowledge of the intrinsic biases of media (and humanity at large) should temper our expectations of their role in society. Dismissing media reports as "biased" is no longer a valid excuse to disregard their content, because bias does not preclude the possibility of truth. Indeed, that media is biased shouldn't automatically discredit them in our eyes - nor cause us to impute any ill motives. What we need are more voices to complete the whole picture; one voice should not be expected to carry the whole weight of the truth. Precisely because it is biased, we need more media, not less. Finally, this should make our leaders deal with it with a mindfulness that for all of its imperfections, media reports does have agency and carry weight throughout the world. Saying "I don't care" in response to negative press coverage is fine, until that negative press translates to the loss of investor confidence, and the driving away of tourists. In short, if we already know that foreign media is looking for villains, our leaders will do well to make sure they don't fit the bill. And we will do well not to dismiss their news reports and opinions outright, because for all we know, their notions of villainy and our notions of treachery one and the same. We too, have a blind eye for the things around us, sometimes because of pride, oftentimes because of our politics. And so while we should take every bit of news with a proverbial grain of salt, we cannot blame the foreign media for placing us at the eye of a storm. Especially if we created the storm ourselves.